During the six years I lived in New York, I became a regular at exactly two places. Neither of these was a restaurant or a bar: I was not recognized at my neighborhood café, the food truck near the park, the bakery near my subway stop. No, the two places at which I was a regular were, one, the deli beneath the office at which I worked and where I would regularly purchase three-dollar soups ladled from steaming stainless steel containers of questionable cleanliness; and, two, the dry cleaners near my apartment where I would drop off bulging bundles after spilling said soup on my sensible separates. Not because the job I was working kept me chained to my desk for a solid sixty hours a week. 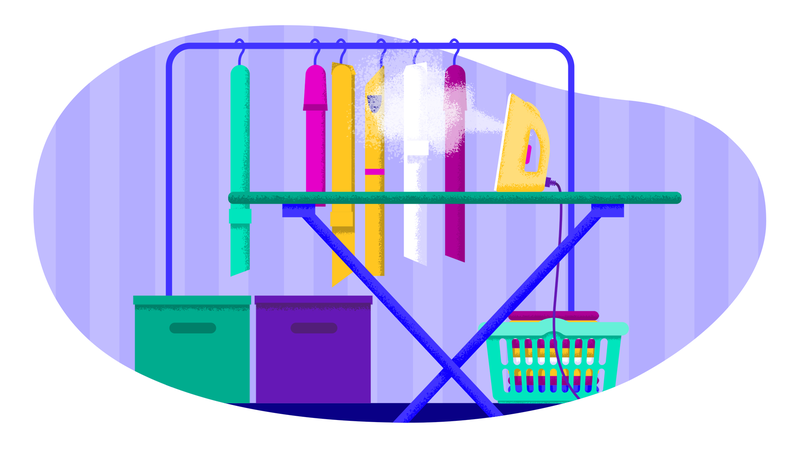 And not because I didn’t know how to soak silk — my mother, a thrifty Italian immigrant, had taught me how to hand-launder delicates when I was still in footy pajamas. No, I persisted in wasting a hefty chunk of my paycheck on dry cleaners because I didn’t own an iron. But now, dear reader, I am here to save you from the fate I so long suffered; I am here to save you from the wasted money, from the shame of wrinkles, and from the fruitless attempts to smooth out a skirt with a heated skillet. The first decision to make is whether to stick with the classic iron-ironing board combo, or to spring for a steamer. I’d long assumed steamers were only for high end and industrial use — the first time I saw one in action was at my own wedding — but in fact, handheld models can be more practical for those who want to waltz into the office wrinkle-free, but don’t need their shirt collars stiff enough to suit P.G. Wodehouse’s Jeeves or Downton Abbey’s Bates. I started my personal journey with a Sunbeam steamer, which is modestly priced at around $60, didn’t take up too much space in my small-even-for-New York apartment, and helped transform my wrinkled separates into professional-looking ensembles. If you’re doing more serious steaming — for professional purposes, or of heavy upholstery fabrics — you might want to spring for a standing model like Reliable’s Vivio 550GC Garment Steamer, but for personal use, something smaller, lighter, more portable and storable will work just fine. If you do want your cuffs crisp as an English butler’s accent — or if you simply enjoy the soothing rhythms of traditional home-care rituals — you might want to make an investment in a high-end iron, which can smooth a wrinkle as well as a steamer, but also creates a crease if you need one. Panasonic’s 360 Degree Freestyle Cordless Iron is somewhere between the handheld and standing steamers, price-wise, and it promises heavy-duty wrinkle removal and the freedom of a cord-free life. Pair it with Brabantia Ironing Board B, whose size makes it ideal for a small apartment, or the slightly larger Homz Durabilt Premium Ironing Board, perfect for those of us who like to iron our sheets, so they’re smooth and toasty when we slip beneath them. Finally, if you do decide to get an iron, make sure you pick a model with a built-in automatic shut-off. (Which the Panasonic does!) A hot iron left resting too long on its soleplate may be a fire hazard — or a dangerous escalation in an impeccably choreographed comedy of errors.